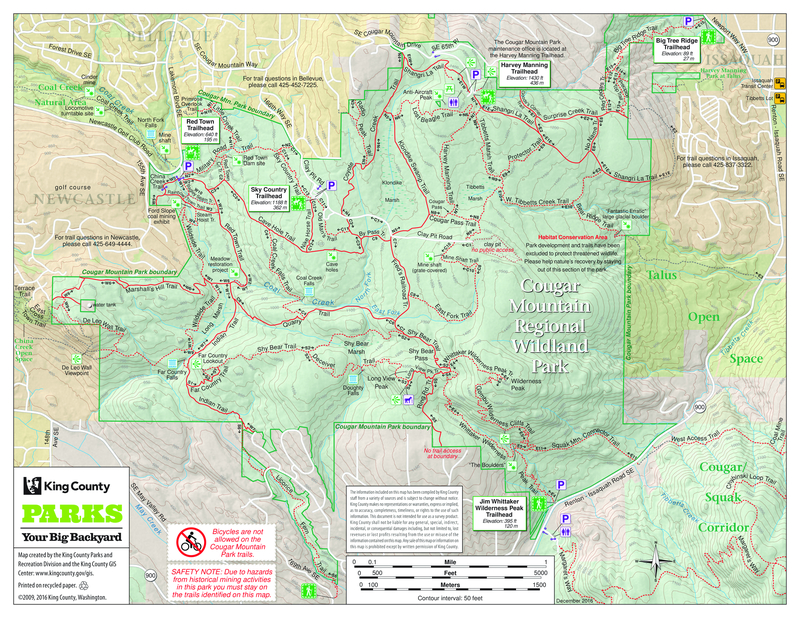 Cougar Mountain is part of the Issaquah Alps and is at the western edge of this range. It is a more of a foothill than a mountain with a high point reaching just over 1600ft. 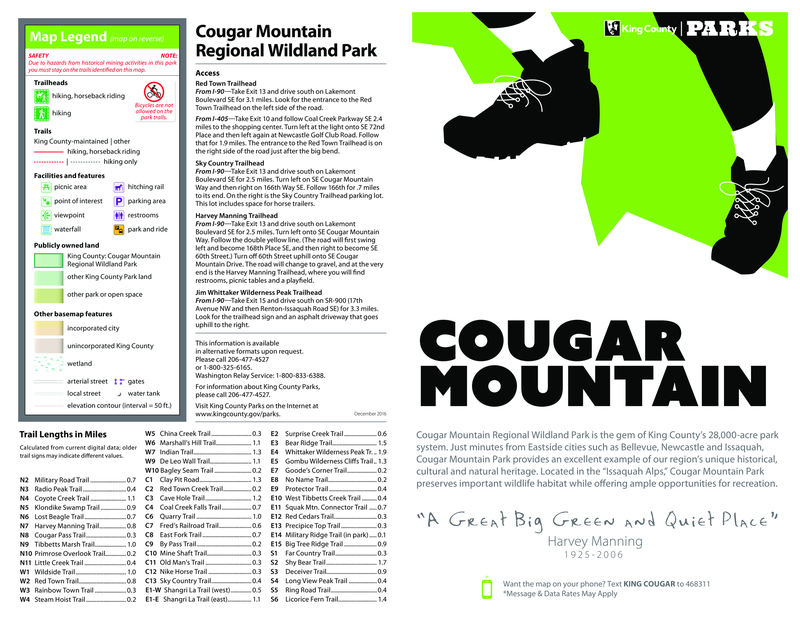 The Marshall's Hill Trail is part of the Cougar Mountain Regional Wildland Park system of trails. This is one of 52 trails in the park and is most easily accessed from the Red Town Trailhead. Many of the trails are very short, less than a mile long, but they all interconnect and so it is very easy to get a decent length hike by cobbling different trails together. And, even though it is a crazy mishmash of trails, they are all very well signed so it very easy to know where you are and where you need to turn to do the hike that you want. That being said, I strongly encourage you to pick up a trail map provided at the trailhead. This will allow you to optimize your route decision making. The trails vary in size, going from car sized widths down to nice sized single tracks typical for city trails. This area is full of history, having been a signicant mining community dating back to the 1860's. Many trails will have info boards or relics left from the past to,help convey what went on before. The park, just on the outskirts of Bellevue, is surrounded by homes, but because of the dense forest you are only aware of this on a few of the exterior trail. There are 5 official trailheads that provide access to this Wildland Park. The Red Town TH has an Info board with a detailed map, a couple of port-a-pots with enough parking for 40 cars. It is important that hikers stay on the trails. The area is strewned with abandoned coal shafts and tunnels that burrow beneath the surface. Cave-ins and poisonous gases are a very real danger. Signs, stating this, dot the park around KNOWN areas. This is an interior trail, so additional hiking will be needed to do this trail. The easiest route to get to this trail will be by starting from the Red Town Trailhead and taking Red Town Trail in .8 miles. Where the Red Town Trail ends is where the Marshall's Hill (MH) Trail begins. All trails are well signed, so there should be no problem picking up the MH Trail and following it to its conclusion. For the first .1 miles the trail is ATV wide and flat. For this short stint, it is actually piggybacking with the Wildside Trail. At .1 miles it splits and becomes its own trail, starting a series of switchbacks. The trail is primarily compact dirt, relatively smooth, but the occasional rock or root will force you to pay some attention to the trail at your feet. It's more of a single track trail, making the surrounding forest seem a little more intimate. After gaining about 130ft, the switchbacks end about .45 miles in. The trail will continue to gain elevation in a very gradual manner, sometimes with a 5ft "climb" only to flatten out thereafter. At about .5 miles you'll start to see that you are not alone. Homes become visible to the north of the trail. There presence comes and goes as the trail makes its way west. The thickness of the forest does a lot in mitigating their presence. At various points along the way, there will be side trails that allow for neighborhood access. There are 3 official connector trails and a fourth that connects to a dirt road that parallels the trail for time. The main trail is clearly marked, so there should be no confusion as to which way to go, (but if recollection serves me well, if you stay to the left you be on the MH Trail). I have the MH Trail ending at 1.4 miles. At this point you have reached a paved road that leads up to water tank. Across the road there is another trail (De Leo Wall Trail). Options are two fold: you can turn around and retrace your steps or continue forward on the De Leo Wall Trail. If you grabbed a trail map at the TH, you have various loop options if you were to decide to go forward. A point of concern. On the the trail map, this trail is listed as being 1.1 miles in length. You will notice that I have the trail ending at 1.4 miles. I did the neighborhood connector trails and I tried to calculate that mileage out when describing the MH Trail. Obviously, there is a discrepancy between the two. I would like to think that my numbers are right, but as you get into the hike you may want to start looking for things earlier than I indicate. Any corrections or feedback would be appreciated. There is no water at the trailhead so plan accordingly. From I-90. Take Exit 13. Drive south on Lakemont SE for 3.1 miles. Trailhead will be on the left side of road, just before a sharp turn in the road. From I-405. Take Exit 10. Follow Coal Creek Parkway SE for 2.4 miles to the shopping center. Turn left onto SE 72nd Place. Then turn left onto Newcastle Golf Club Road. Drive east for 1.9 miles. Trailhead will be on the right side of the road.